A live octopus hiding inside of a stereo speaker and a demon head attached to a baby stroller aren’t everyday finds along the Pacific Coast of California. But you can guarantee that on a day with more than 51,543 volunteers to lend a hand, someone is bound to find something strange lurking below the water’s surface. 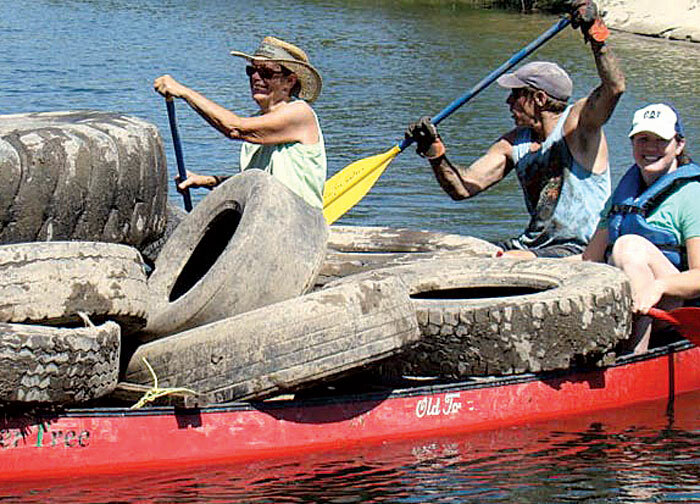 From the borders of Mexico and Oregon, around San Francisco Bay and at sites as far inland as Lake Tahoe, thousands of Californians volunteered to lend a hand on what was both California Coastal Cleanup Day and International Coastal Cleanup Day Sept. 21, raking in more than 501,748 pounds of waterborne debris. 471,218 pounds of trash and an additional 30,530 pounds of recyclable material were removed from California’s coast, making a grand total of 251 tons that were cleaned out in one day. According to data from previous cleanups, between 60 and 80 percent of the debris from California’s beaches and shorelines originates from land-based sources, traveling through storm drains, creeks and rivers before ending up on beaches, in bays and in harbors. This year, there was an added source of coastal pollution, as debris floated into local waters from Japan. As items that washed across the Pacific from the devastating tsunami that struck Japan in March 2011 have finally started to reach California’s coast. Volunteers at various sites carried a data card, designed by the Coastal Commission and the National Oceanic and Atmospheric Administration (NOAA) Marine Debris Program, to track potential tsunami debris. Despite their efforts, in more than 40 cleanup sites that had been tracked for eight months for potential tsunami debris, during those cleanups, volunteers only found a dozen items that were considered suspected tsunami debris. California volunteers typically find upwards of 850,000 debris items of domestic trash, in only three hours of cleanup time. Apart from cleaning, volunteers were also encouraged to have a bit of fun, with a Most Unusual Item Competition and photo contest. The winners for most unusual trash, who discovered the stereo speaker with an octopus in Long Beach (the octopus was returned to the ocean) and the demonic baby stroller in the Sierra Nevada, received prizes of $100 gift cards from Whole Foods Market. Those who were unable to participate in 2013 Coastal Cleanup can still volunteer for Coastweeks, a national three-week celebration of coastal resources. To get involved with Coastweeks or to find out how you can become a “coastal steward” year-round, call (800) COAST-4U or visit coast4u.org.